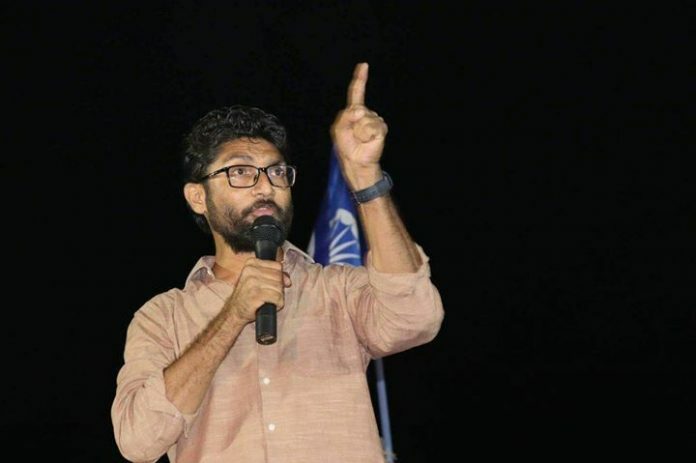 Who really is Jignesh Mevani: a Dalit, a Gujarati or a Jihadi? Home Politics Gujarat Election 2017 Who really is Jignesh Mevani: a Dalit, Gujarati or Jihadi? Jignesh Mevani is trying to carve out a new way to run for office in Gujarat: one that uses the resources of the Congress party without using its name or succumbing to its patronising views on Muslims and Dalits. Depending on your perspective, Roy’s donation is either a source of pride or embarrassment for the 35-year-old Dalit activist Mevani. Ever since he launched his campaign for Gujarat assembly as an independent candidate, Mevani has been dogged by criticism that his appeal is greater among English speaking elites than it is among Dalits. Now, as Gujarat inches towards the finish line of its elections, Mevani has been plagued by an even more damning accusation: that his campaign is being supported by right-wing Muslims. This past Saturday, I traveled to Vadgam, the constituency Mevani is contesting from in Gujarat’s Sabarkatha district, about 140 kilometers away from Ahmedabad. On the journey there, a passenger next to me showed me the responses he received after posting about Mevani on Facebook. On the second floor of a hotel, with a security guard stationed at the door, Mevani sat on a bed. His campaign team and supporters stand around him, facing a photo of B.R. Ambedkar. He fields an inquiry from a man who arrived with 350 other Dalits from Rajasthan, wanting to help. That’s another criticism—that Mevani is trying to win a seat without a lot of local support. He is from Mehsana, his Dalit agitation was largely focused on Saurashtra, and he has spent most of his life in Ahmedabad, first as a journalist, later as a lawyer. But the numbers might work in his favor. The Vadgam constituency is reserved for Scheduled Caste candidates and has about 2.6 lakh voters, of which 70,000 are Muslims, 40,000 are Dalits, 30,000 are Thakores, and 5,000 belong to the Patidar community. The Congress has thrown its own weight behind Mevani, even though Mevani is running as an independent. His main opponent is Ashwin Parmar, the son of former Congress MLA Dolat Parmar, who is running for office despite not getting the nod from the Congress party. The BJP candidate is Chakravarti Vijaykumar Harkhabhai but stands a slim chance of winning because the Congress won the seat in 2012 with a comfortable margin of about 13 percentage points. But being an “independent,” is a fungible term. From a distance, Mevani’s party symbol — the tri-colour with a sewing machine in the middle — looks like the flag of the Indian National Congress. When a few young residents of Ahmedabad wanted to go door knocking for Mevani, some in Mevani’s team did not know the area of Vadgam well enough to guide them. As a result, a Congress party worker had to step forward to assist them. And yet despite this, Mevani’s supporters says he has already made an impact on the Gujarat elections and forced a conversation about Dalits in Gujarat. Mevani laughed when I asked him if he considers himself to be a Gujarati or a Dalit first, a laugh that suggested, perhaps, a familiarity with this most inane of questions. “A person can have many firsts. I am a Dalit first and a Gujarati first,” Mevani said. What struck me about his answer is that it differed from almost every Dalit I met at his campaign office, each of whom told me without hesitation that they are “Gujarati first.” This election has been about many things, including the frustrating binaries of masjid/mandir, national/anti-national. Mevani said he wanted to puncture this narrative, to show that a person who has multiple ways of being should not be considered a threat. It’s a point Mevani kept reiterating: “No matter how great a poet is, no matter how powerful his words are, he will always be considered a Dalit poet and not just a poet,” he said. On other issues, however, his answers were a bit evasive. Last week, it was reported that his campaign received a Rs 50,000 cheque from the Social Democratic Party of India (SDPI), which has been accused of terror links. Mevani has denied the allegations and suggested that anyone can donate to his campaign. “If the BJP calls me a terrorist tomorrow, I won’t be surprised at all,” Mevani said. Later he indicated he might sue the BJP over these Jihadi allegations. For election watchers, this last point might be the most intriguing. Regardless of whether or not Mevani wins, he is trying to carve out a new way to run for office in Gujarat: one that uses the resources of the Congress party without using its name or succumbing to its patronizing views on Muslims and Dalits. At Saturday’s rally, Rahul Gandhi’s helicopter arrived right on time in Vadgam but it was Mevani who took the podium before him. Along with hundreds of others, I left soon after Mevani spoke and did not stay for Gandhi’s speech. This article was originally published on 12 December.